What Will Duterte Mean for Philippine Foreign Policy? From ASEAN to China to the U.S., how will the Philippines’ new president approach foreign relations? Given his fearsome rhetoric and blunt speaking it is not surprising that many fear that the new populist president of the Philippines could have a destabilizing impact on the region. Some worry his “Dirty Harry” persona could tip the republic into conflict with China and, through the Philippines’ alliance with the United States, drag the region into a major conflagration. Others see an unpredictable man who could just as easily pander to China’s overtures and strike a deal with the communist country to support his economic ambitions at home. Rodrigo Duterte’s complex character and his inexperience and lack of interest in foreign affairs make anticipating his international policy challenging. However, there are some clear signs evident about we can expect. Despite his enigmatic character, Duterte is a leader who, at least in the short term, is very likely to focus on domestic priorities. Rather than taking an approach in which foreign policy has a logic of its own or in which international and domestic considerations are taken together — for example thinking about the South China Sea dispute in terms of both Philippines interests as well as its alliance commitments — he is likely to follow a foreign policy that provides an international environment most conducive to achieving his domestic priorities. In particular, he has signaled a very heavy emphasis on domestic state-building programs related to infrastructure and economic reform. It is likely that these will trump broader international considerations. From a security policy point of view he has also indicated that he will be heavily inwardly focused. By far his highest priority will be resolving the long-running insurgencies in the country’s south. Not only is this the result of his Mindanao heritage and interest, he also sees ending those long-running issues as key to long term stability and prosperity in the country. So as an inwardly focused, populist, anti-elite politician whose priorities remain on domestic questions of governance, economic development, and domestic security, he has more than a little in common with the leader of the region’s other major archipelagic state: Indonesia’s Joko “Jokowi” Widodo. It is not unreasonable to assume that Jokowi’s track record on a number of issues gives us a sense of how Duterte might travel. For all countries in the region, ASEAN looms large. Indeed it is the organization’s article of faith that ASEAN is the centerpiece of its members’ international policy, matched only by the notion that members display a strong sense of solidarity. As the organization’s second largest country and one of its most vibrant democracies, the Philippines has long been a crucial member. Yet Duterte’s nationalist impulses and his priority on domestic issues are going to compound the challenges the grouping faces as it embarks on its ambitious economic and political community building programs. ASEAN has been challenged by Indonesia’s ambivalence toward it due to its inward focus and, assuming the Philippines behaves similarly, the grouping will be entering a difficult period as its two most important countries give the body a lower priority. The second big feature of the Philippines’ international policy is its relations with the major powers and in particular with the United States and Japan. Earlier in the year, Washington and Manila operationalized an agreement allowing U.S. forces access to five bases in the archipelago. This was the culmination of efforts by both parties to strengthen their security and strategic ties, primarily driven by shared concerns about China. Although Duterte will not turn his back on Washington, it is unlikely that he will continue the trajectory started by his predecessor. Security collaboration will be sought less for concerns about China and the dispute with the South China Sea — Benigno Aquino was keen to increase U.S. commitments to dissuade China — and much more for support in resolving the long-running dispute with rebels in Mindanao. Duterte will also place a much greater priority on attracting economic interest to the Philippines to help advance his infrastructure investment ambitions. Relations with Japan are likely to be similarly influenced. Where in the past, Japan had sought to develop both strategic and economic ties to the Philippines for reasons that were as much to do with China as they were to do with shared interests, Duterte’s links to Tokyo will be shaped by domestic priorities. In short, the Philippines is likely to develop far more of a transactional relationship with Japan and the United States. The other crucial major power for the Philippines is the one with whom it is involved in a complex territorial dispute: China. Prior to his election, Duterte sent decidedly mixed signals about the South China Sea dispute. For example, he declared that he would use a jet ski to personally plant the Philippines flag on the contested Scarborough Shoal. Within days, he indicated that he would also be open to bilateral negotiation — China’s preferred option. Although he is nationalistic and has a domestic political persona of toughness and resolution in the face of overbearing opposition, it is difficult to see him seeking to inflame relations with China. The communist country is an extremely important economic partner for the Philippines and potentially a source of investment and support for the kind of reform program Duterte envisages. Yet it is precisely his nationalism which is likely to prevent him from being too accommodating of China. The U.S. and its allies will be actively courting him and his advisers to maintain the substance of the Aquino policy, and a unified position with the United States, and he is likely to do this but in a more diplomatically low key manner than in the past. The challenge will be how to do this given the surprisingly pro-Manila judgement handed down by the arbitral tribunal on July 12. So far, the foreign ministry has issued a sparse statement while the president has refrained from commenting. He previously promised neither to “taunt nor flaunt” the judgement, a commitment he has so far kept. However, he will have to determine how to achieve his aims to get economically closer to China while not damaging his nationalist credentials or souring ties with Washington. This will require a deftness of touch for which he is not known. Despite his bravado and lack of any clear signals as to where his foreign policy priorities lie, Duterte is unlikely to be a destabilizing force in regional international politics. There will be more continuity than change; however, the subtle shifts will still have consequences. ASEAN is likely to be the biggest loser; the U.S. will miss Aquino’s approach, but China is unlikely to have in the presidential palace someone with whom they can do business with any degree of comfort. The biggest challenge Duterte will have is that he will want to focus the bulk of his efforts at home, yet the world is unlikely to allow him this luxury. Nick Bisley is Executive Director of La Trobe Asia and Professor of International Relations at La Trobe University, Australia. 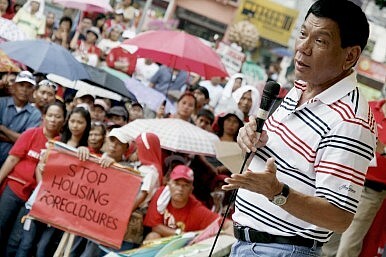 One year after his inauguration, how is the Philippine president faring? The Surprising New Challenge for the US in the South China SeaThe Philippines Under Duterte: Reassurance Needed At Home and Abroad Philippines Slams China's South China Sea FlotillaUS, Philippine Air Forces Conduct Bilateral Air Contingent Exchange Amid UncertaintiesIs China Going to Take Over a Major Philippines Shipyard?